Damaged nerves in your brain and spinal cord. It can also occur in the peripheral nerves, which are located throughout the rest of your body. Your nervous system is involved in everything your body does, from regulating your breathing to controlling your muscles and sensing heat and cold. Autonomic nerves. These nerves control the involuntary or partially voluntary activities of your body, including heart rate, blood pressure, digestion, and temperature regulation. Motor nerves. These nerves control your movements and actions by passing information from your brain and spinal cord to your muscles. Sensory nerves. These nerves relay information from your skin and muscles back to your spinal cord and brain. The information is then processed to let you feel pain and other sensations. Because nerves are essential to all you do, nerve pain and damage can seriously affect your quality of life. How do you check for nerve damage? Similar to testing current flow in a wire, nerve conduction velocity test (NCV) is an electrical test, ordered by your doctor, used to detect abnormal nerve conditions. It is usually ordered to diagnose or evaluate a nerve injury in a person who has weakness or numbness in the arms or legs. What Are the Symptoms of Nerve Pain and Nerve Damage? With nerve damage, there can be a wide array of symptoms. Which ones you may have depended on the location and type of nerves that are affected. Damage can occur to nerves in your brain and spinal cord. It can also occur in the peripheral nerves, which are located throughout the rest of your body. In some instances, people with nerve damage will have symptoms that indicate damage to two, or even three, different types of nerves. For instance, you might experience weakness and burning of your legs at the same time. Trauma whether by a physical Injury or surgery is a common cause of neuropathy, nerve damage. Trauma – Physical Injuries are the most common cause of injury to a nerve. Injury or sudden trauma, such as from automobile accidents, falls, sports-related activities. etc., can cause nerves to be partially or completely severed, crushed, compressed, or stretched, sometimes so forcefully that they are partially or completely detached from the spinal cord. How can this trauma in injuries damage the nerves? Broken or dislocated bones can exert damaging pressure on neighboring nerves, and slipped disks between vertebrae can compress nerve fibers where they emerge from the spinal cord. Trauma can cause pressure neuropathy. This is “pinching” a nerve by putting too much pressure on it. For example, the sciatic nerve may be painfully compressed by a ruptured disc in the lower spine, causing sciatica. Pressure neuropathy is also called nerve compression. Entrapment neuropathy (neuralgia, neuritis, pinched or trapped nerve) is caused by physical compression or irritation of major nerve trunks and peripheral nerves, producing distant nerve pain symptoms. Certain sites in the body are more likely to produce nerve entrapment because of anatomical vulnerability that can be created by trauma. Repetitive stress – frequently leads to entrapment neuropathies, a special category of compression injury. Carpal tunnel syndrome is an example of repetitive stress. Cumulative damage can result from repetitive, forceful, awkward activities that require flexing of any group of joints for prolonged periods. The resulting irritation may cause ligaments, tendons, and muscles to become inflamed and swollen, constricting the narrow passageways through which some nerves pass. Compression neuropathy – pressure on an area can result in an inability to transmit nerve impulses because compression has damaged nerve fibers either directly or indirectly by restricting their supply of oxygen. Trauma that causes severe muscle injuries can compress the nerve. .It all depends on the nerve compressed. Benefits include pain reduction, tension relief, improved mobility and stress reduction. 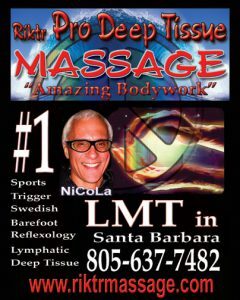 Deep-tissue massage utilizes slow strokes, direct pressure or friction applied across the grain of the muscles with the fingers, thumbs or elbows. … This technique is useful in treating chronic pain, inflammation, and injury. Massage or massage therapy is a system of structured palpations or movements of the soft tissues of the body. The massage system may include, but is not limited to, such techniques as, stroking, kneading, gliding, percussion, friction, vibration, compression, passive or active stretching within the normal anatomical range of movement; effleurage (either firm or light soothing, stroking movement, without dragging the skin, using either padded parts of fingertips or palms); petrissage (lifting or picking up muscles and rolling the folds of skin); or tapotement (striking with the side of the hand, usually with partly flexed fingers, rhythmic movements with fingers or short rapid movements of sides of the hand). These techniques may be applied with or without the aid of lubricants, salt or herbal preparations, hydromassage, thermal massage or a massage device that mimics or enhances the actions possible by human hands. The purpose of the practice of massage is to enhance the general health and well-being of the recipient. Massage does not include the diagnosis of a specific pathology, the prescription of drugs or controlled substances, spinal manipulation or those acts of physical therapy that are outside the scope of massage therapy. Today, people use many different types of massage therapy for a variety of health-related purposes, such as pain management, prevent injuries, restore a healthy immune system, reduce stress, increase relaxation, address anxiety and depression, and facilitate overall wellness. In the United States, massage therapy is often considered part of complementary and alternative medicine (CAM), although it does have some conventional uses. It is increasingly being offered along with standard treatment for a wide range of medical conditions and situations. From a sprained ankle or twisted knee to muscle spasms or broken bones, massage can provide the opportunity for faster recovery. … Deep Tissue Massage — helps flush lactic acid and other metabolic waste from your muscles, allowing more oxygen-rich and nutrient-filled blood to flow in. An Athlete’s peak performance may be dependent upon the proper use and application of sports massage. More than a treatment for injuries, sports massage produces overwhelming benefits for athletes physically, physiologically, and psychologically. Sports massage is designed to prepare the athlete for their best performance, reduce fatigue, and relieve muscle swelling and tension. During physical activity—especially strenuous—muscle tension builds up in the body’s soft tissues. Due to overextension or overuse, minor injuries and lesions occur in these tissues that can cause a great deal of pain and poor athletic performance. Sports massage helps alleviate pain and prevent such injuries that greatly affect flexibility, mobility, response time, and overall performance in athletic events. One of the most common setbacks for athletes is delayed-onset muscle soreness, more commonly known as DOMS. This refers to muscle pain that typically develops several hours postexercise and consists of predominantly eccentric muscle actions—especially if the exercise is unfamiliar. Although DOMS is likely a symptom eccentric-exercise-induced muscle damage, it does not necessarily affect muscle damage. Recent studies have concluded that sports massage may help reduce and prevent the often-painful and debilitating effects of DOMS in athletes. An Australian study involving 5 healthy men and women who performed a variety of new exercises, has concluded that massage played a key role in easing DOMS. “Massage was effective in alleviating DOMS by approximately 30% and reducing swelling.” Massage can reduce this through the improved blood and lymphatic system circulation that assists in the removal of metabolites and other toxins. Heavily exercised muscles may also lose their capacity to relax. This causes chronically tight muscles and loss of flexibility. Lack of flexibility is often linked to muscle soreness and predisposes athletes to injuries– especially muscle pulls and tears. Blood flow through tight muscles is poor (ischemia), which also causes pain. A regular routine of massage therapy is very effective in combating these effects of heavy exercised muscles. “Muscular strain is a common sports-related injury with the potential to chronically impair performance when sound principles of injury recognition, immediate treatment, rehabilitation, and prevention are ignored.” When preventive techniques such as sports massage are applied, according to Glen A Halvorson, MD, severe muscular strain may be avoided. 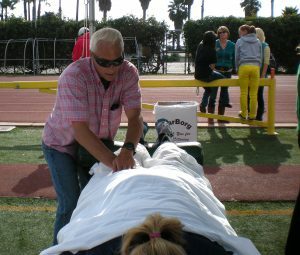 Sports massage should be applied before and after athletic events, with many “maintenance” sessions in-between meets or competitions. Pre-event sports massage focuses on warming-up the major muscles to be used and improves tissue pliability. It also helps get the athlete in a good mental state for competition and prepares them to reach their athletic performance potential. Post-event sports massage is given following an athletic event and is mainly focused upon recovery. This type of sports massage is geared toward reducing muscle spasms and metabolic build-up that occur with vigorous exercise. Integrated into a weekly training regimen, athletes may avoid DOMS, relax and revitalize muscles, and feel calmer and more focused before and after events. Sports massages alleviate muscle tension. A massage therapist is able to target tight and tender areas—also referred to as adhesions—with high levels of force. This signals your nervous system to relax, helping to alleviate tension within the targeted muscle. Sports massages improve recovery. A sports massage after a tough workout or game may improve recovery by increasing circulation. In fact, a study found that a massage decreased delayed-onset muscle soreness—the extreme soreness you get when exercising a muscle for the first time in a while—by about 30 percent. Sports massages increase the range of motion. Have tight shoulders, hips or other joints? A sports massage can target the stiff muscles that are binding up your joints so you can move through a greater range of motion. Sports massages are more targeted than foam rolling. Foam rolling is great, but a roller can only target large, broad muscles. Even a lacrosse ball can’t replicate what a massage therapist can do with their fingers, thumbs, palms, and elbows. Sports massages are relaxing and feel good. Is your body banged up from constantly pushing yourself? Or are you a bit stressed from your jam-packed schedule of school, sports, training, and homework? A massage can help you relax and alleviate some of this physical and psychological stress. So when should you get a sports massage? In an ideal world, Nicola recommends getting one or two sports massages per week. If this isn’t feasible, then get a massage as needed or use a foam roller, which is a good (and free) alternative—although it’s not quite as effective as a massage as mentioned above. Also, make sure to give yourself 3-4 days between a massage and a big game to ensure your muscles are firing optimally when you need to perform. The information provided is for educational purposes only and is not intended as diagnosis, treatment, or prescription of any kind. The decision to use, or not to use, any information is the sole responsibility of the reader. All trademarks, registered trademarks, brand names, registered brand names, logos, and company logos referenced in this post are the property of their owners.